If you want to go to the Kerala district of Wayanad (see all posts on Wayanad), set on the Western Ghats, one way is to do so via Gundalpet. This is of course assuming that you are driving from Bangalore or Mysore. If you are driving from Bangalore that would indeed be the shortest path I believe. 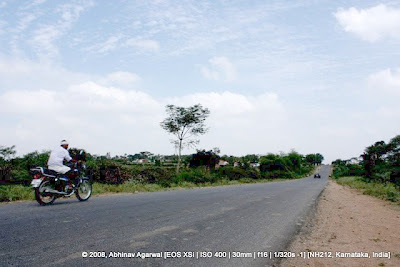 From Bangalore to Mysore via the four-laned SH17, then on to NH 212, to Gundalpet via Nanjangud. After you cross Gundalpet you need to make a right to continue on to NH 212. If you go straight, that will lead you to Bandipur (see posts), but via NH 67, and on to Tamil Nadu, the Mudumalai National Park, and the hill stations of Ooty and Coonoor. One thing you notice as soon as you get on this stretch of the highway is that the road is excellent. Parts of the highway did not have lane markings when we drove, but that could be because the asphalt looked recently laid. No speed-breakers either! Lovely. Till you hit the outer periphery of the Bandipur National Park, traffic and conditions permitting, you can do 100kmph on the highway. As you enter the outer sections of the Bandipur National Park, the vegetation gets decidedly thicker, the habitation decidedly sparser, and the correct thing to do is to slow down and take in the serene drive at a more leisurely pace. The thick vegetation and the tree cover makes for quite a picturesque view. If you like photography, or even if you do not, it makes for an ideal spot to pull over by the kerb and take in the scenery. I did so, and as I was shooting, I was very glad indeed to find someone as eager into highway photography that I had to snap this photo! By the way, it goes without saying that standing in the middle of a highway to photograph the highway is not a wise thing to do. No sir. Traffic was thin, so one could take the chance, unlike the Bangalore-Mysore highway that is decidedly busier, and with traffic moving much faster. What is a forest drive without monkeys? It's not a forest drive.What is a forest drive without stopping to feed the monkeys? Not a forest drive. One of the more enterprising things done by the Karnataka state government(s) over the years has been to put up these very distinctive signs for Karnataka Tourism that provide travelers with useful information at a glance. Like the prominent tourist attractions along the highway and the distance. The icons on the left also give you an indication of the type of tourist attraction. The temple icon next to Nanjangud for example tells you there is a historic temple there.